HemiPleat conductive, anti-static cartridges are available to fit any industrial dust collector. 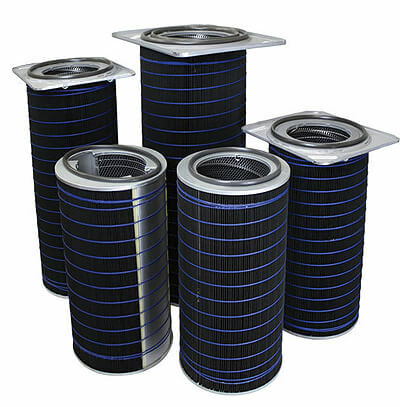 HemiPleat conductive filters combine high filtration efficiency, long service life, and energy-efficient performance with anti-static properties. We use a special carbon-impregnated media designed for use where conveyed dusts generate static charges that require dissipation. Conductive cartridges can also be used on dusts that are explosive to meet NFPA requirements for grounded media. The HemiPleat anti-static media is available in the full selection of HemiPleat cartridge styles, to fit virtually all new and existing cartridge dust collectors. It is also the only filter to combine anti-static properties with an award-winning, patented open-pleat design that results in better airflow through the cartridge and better cleaning characteristics, resulting in energy-efficient performance and long life. HMPTC – PolyTech™ Conductive (color: black) – MERV 10 proprietary blend of cellulosic fibers and polyester fibers with a moisture-resistant silicone treatment for optimum dust release characteristics yielding long service life at high filtration efficiencies. Chemically treated and impregnated with carbon for static dissipation. 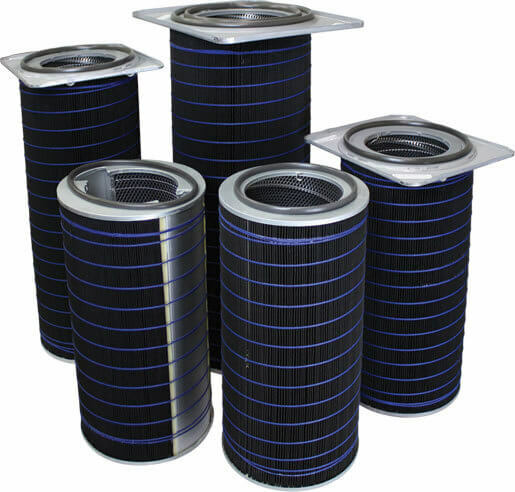 This filter is the first to combine flame-retardant and conductive properties in a single filter that also offers high efficiency, long service life, and energy-efficient performance. The special carbon-impregnated filtration media is designed for dust-handling applications that require flame resistance as well as dissipation of static charges – including many metal dusts; fumed silica dust; plastic, PVC or composite dusts; pharmaceutical dusts and carbon black/toner dusts. The cartridge filters are especially suited to explosive dust applications, making it possible to conform to NFPA and ATEX requirements and lessen the risk of ignition sources due to static electricity charges. View our Performance Guarantee (PDF) - HemiPleat will run at a lower pressure drop (to save energy), meet or exceed current collection efficiencies, and last longer - or your money back!